Guelph has a population of around 120,000. It’s located just west of Toronto and around 30km east of Waterloo. Guelph’s nickname is the Royal City and is located in Wellington County. It’s consistently ranked as one of the top places to live in Canada because it has lower crime rates, a high standard of living and great scenery. In around 2011, Guelph had the lowest unemployment rate in Canada at 4 percent. Guelph is home the Sleeman Brewery, the Ontario Veterinary College and the House of Slam, the home court of the CIS Guelph Gryphon basketball team. Who can ever forget the House of Slam? Guelph’s downtown is lovely featuring some of Ontario’s most intact style of Victorian building you’ll ever see. Guelph’s downtown sits at the meeting of the Eramosa and Speed Rivers. Speaking of Speed River, Guelph is also home to Canada’s pre-eminent racing community, Speed River Race Club. Speed River has produced some of Canada’s best marathon runners. These are world class Olympic marathoners we’re talking about. Brian Goldfinger, the directing lawyer of Goldfinger Law is an avid runner and has his own competing race club. Modeled after Speed River Race Club, Goldfinger Speed is the race club founded by Brian Goldfinger. Goldfinger Law is the founding sponsor of Goldfinger Speed. Goldfinger Speed has funded a team of runners so they could participate in the New York Marathon, and has made donations to the Brain Injury Association. Following the shattering of a personal best in a race, Goldfinger Speed will make a donation to a Brain Injury Association to commemorate that team member’s achievement. It’s Goldfinger Law’s way of giving back to the personal injury community. So look out Speed River Racing because Goldfinger Speed is hot on your tails! When car accidents happen in Guelph, accident victims are treated at Guelph General Hospital, or St. Joseph’s Hospital. Guelph is also home to the University of Guelph which has Ontario’s only veterinary school OVC. If you or a loved one have been hurt of injured in an accident in Guelph or Wellington County, call Goldfinger Law today toll free at 1-877-730-1777 for your free consultation with one of our personal injury lawyers. 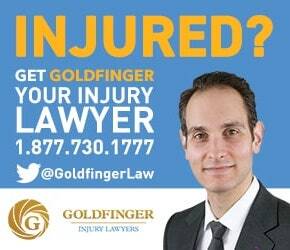 Goldfinger Injury Lawyers routinely services Guelph and Wellington County. We will come and visit you for free at your home or at hospital.